Is anybody tired of seeing Fall photos? I hope not, for this is my favorite time of year, and I can’t resist adding a few more to the collections already on the Internet. We’ve been especially fortunate here in Central Illinois at having a spectacular showing of color put on by Mother Nature. The reds, yellows, oranges, and golds really stand out when the grass is so green. And it’s green thanks to all the rain we had during the Spring and Summer months. So let’s not wait another minute — come with me on a jaunt around the area and please enjoy the scenery! 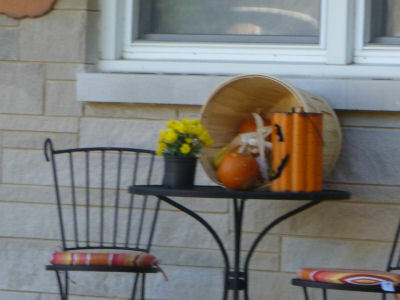 Don’t you just love Fall decorations? 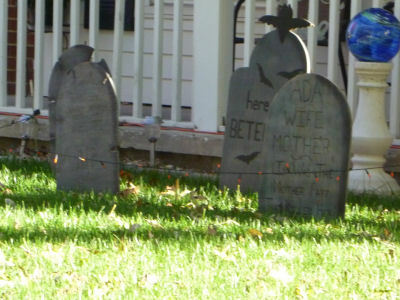 Somebody got creative with this pretend cemetery! 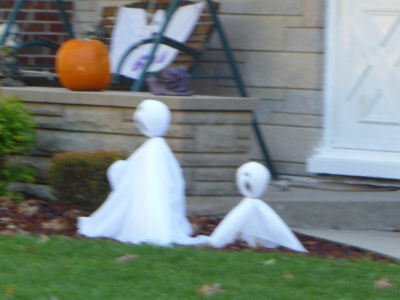 Happy Howl-o-ween to all my ghostie-friends! 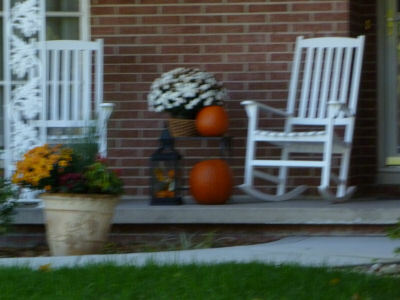 This entry was posted in Seasonal and tagged Fall decorations, Fall in Central Illinois, fall photos, Fire Bush, Imptiens, mums, pumpkins. Bookmark the permalink. Gorgeous! Hopefully will post a few of my fall pics soon. I’m looking forward to seeing them, Suzi! I love the fire bush, and I love Dallas. He’s beautiful. But tell him I said ‘handsome’. He gets that “beautiful” stuff all the time, Professor, and I think he equates it with “handsome.” So you’re good! Thanks for stopping by. 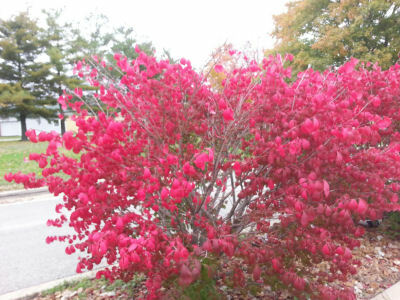 That bush is also called a Burning Bush (http://www.brighterblooms.com/product/burning-bush-euonymus.html?utm_source=google&utm_medium=shopping&utm_term=10034&gclid=CPqM-NqP1cECFWKCMgod9FEAQg). Not me, Debbie! I could look at Fall photos all year round because like you, this is my FAVORITE time of the year! 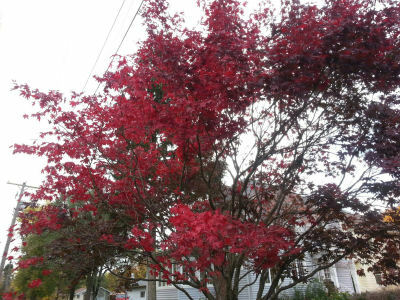 The trees where you live are stunning! As you know, I had to go outside the city here to find the really colorful ones because they just don’t turn like the trees out in the burbs. I totally smiled at the photos of all the Halloween decorations, and also the one of Dallas in the leaves :) He is beyond adorable. What a precious face! Thanks for sharing Fall in your part of the States, my friend. ENJOYED! I’m quite lucky to be able to step outside my front door and experience so much beautiful Fall color, Ron. Folks in my area often go into the woods or even to nearby states to take in the season, but I’ve been a bit swamped this year, so local was the best I could manage. Glad it sufficed! Dallas is going to burst with pride over all these compliments (not that he doesn’t know he looks good, ha!). He’d just come back from the groomer’s when I took that photo, and she did an exceptionally good job with him this time. I’m not tired of fall colors, because we don’t have any yet! By the time ours arrive, yours may be completely gone. 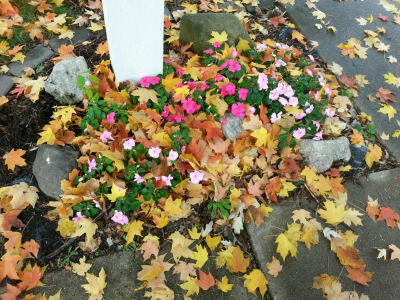 Believe it or not, my favorite photo is of the leaves fallen onto the sidewalk and the impatiens. Next is Dallas in the leaves. 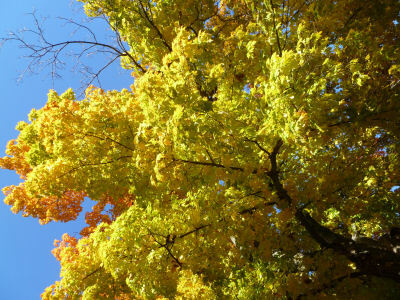 There are so many different scents that come along with autumn, too: wet leaves, burning leaves, rotting leaves. I love them all. How well I remember Fall arriving so “late,” Linda, when I lived in Texas. As a Midwesterner, I was eager to experience “sweater weather,” but many times, the temps were still in the 80s in October. I moved around quite a bit as a journalist, so I got to enjoy the upper coast, the west, and the north-central regions, all very different and very impressive in their own ways. I like the shot with the Impatiens, too. Something about what we think of as a summer flower covered in those obviously Fall-like leaves grabbed my attention. Our nights are supposed to get quite cool here before too long, so I can’t imagine these Impatiens surviving unless they’re covered. Very pretty fall in your part of the state. Love the decorations and the Fallish Dallas added for style and class. I imagine you’re having weather much like ours, Kb. The nights are quite cool, and the days warm up to the 50s or so. With Daylight Saving Time arriving this weekend, though, we’ll have fewer hours for the sun to warm things up, opening the way for frost. And eventually snow. Nah, let’s not think about that. Not yet!! You know, Monica, I’ve watched those Impatiens all summer and wanted to get a shot of them. The leaves just gave me a good excuse! Dogs like Dallas grow a winter coat, which protects them from cold temps. I have several jackets for him for when it gets REALLY cold, but he doesn’t seem to like them. I also have cute little boots for his feeties, but he doesn’t like them either. Sigh. We do what we can to protect them, but perhaps Mother Nature provides exactly what they need without our intervention?! Of course I’m not tired of fall pics (might even get some of my own tomorrow – took a vacation day and will be going on a hike!) 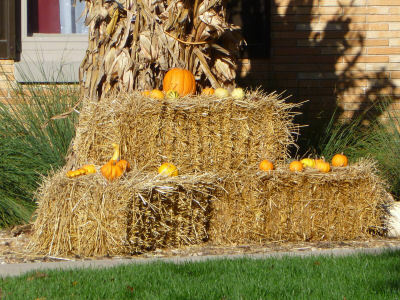 I like the decoration set up with the bales of hay – that’s different from what I’ve seen before. 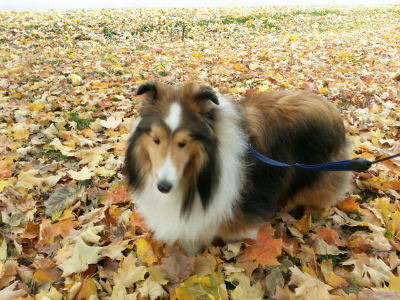 Thanks, Janna, and I’ll be watching to see your Fall photos! 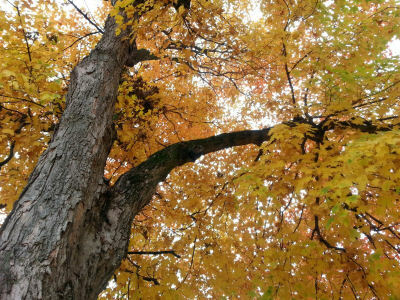 It just amazes me to see different parts of the U.S. decked out in autumnal splendor. Bless you, Kim, for saying that! He IS my star, and I can’t imagine life without him. Hugs to you — is it brr-cold up there yet?? Thanks for the neighborhood stroll. The day I tire of seeing fall colors in photos and real life is the day I stop loving chocolate. Very pretty. Well said, Barb. Thanks for coming along, and I’m glad you enjoy them, too!